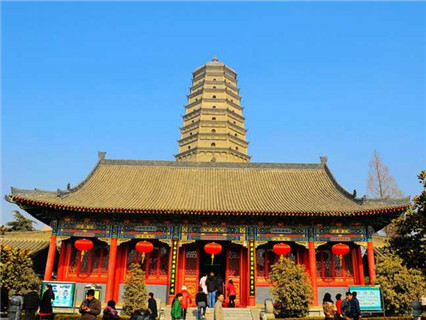 Pick up from your hotel on departure time, then go to Famen Temple,widely regarded as the "ancestor of pagoda temples in Guanzhong area". It currently maintains such a layout as Grand Hall following Pagoda. It is typical layout of the early Buddhist temples in China. Maoling Mausoleum, Regarding as the tomb of Emperor Wudi in the Western Han Dynasty (206BC-8AD), it is the biggest mausoleum among the imperial mausoleums of the Western Han Dynasty. Finally, visit Qianling Mausoleum. 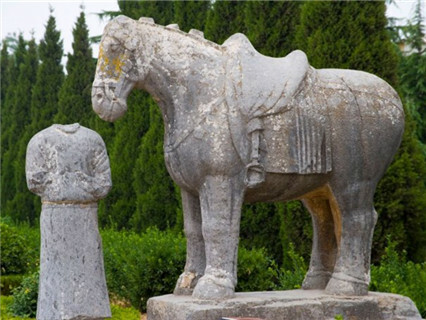 The mausoleum is renowned for its many Tang Dynasty stone statues located above ground and the mural paintings adorning the subterranean walls of the tombs. Pick-up and drop off service from your hotel. Tips for the tour guide and driver. English Speaking tour guide. Personal fee. 1. You can book online and pay cash to tour guide, just inform us your hotel in Xian, we will send you confirmation email. 2. When you arrive in Xian, our tour guide will call you the night before the tour to inform pick-up time in the next morning. Enquiry : I am fine with both coach or private tour as long as it's reasonable price for 3 ppl , I want a tour to Terra Cotta warriors, Banpo Museum, MaoLing and QianLing Museum,We are staying at Xian Citadines hotel,Kindly get back to me on your charges. Thank you! Reply : But for the tour to FaMen Temple, MaoLing and QianLing Museum, we don't have Group Tours available, if you think that private tour is OK, then price is $275 (1,670CNY) Per Person.If it's OK, please let us know.